John Cohen at Merle Wood & Associates tells me that the sale of the 48.8m motor yacht VF-15, his joint listing with Merle Wood, closed yesterday with Michael Rafferty at Camper & Nicholsons representing the buyer. Delivered by Christensen in 2009, VF-15 is the forerunner of the popular 160 series from the yard and is ABS classed and MCA compliant. Her sleek exterior styling, executed by the highly experienced in-house Christensen design & engineering team combined with an interior décor by Carol Williamson & Associates, have created a world class ocean going motor yacht. VF-15 can comfortably accommodate 12/16 guests in six staterooms. The full beam master suite is located forward on the main deck and is complete with his & hers master bath as well as a private study. 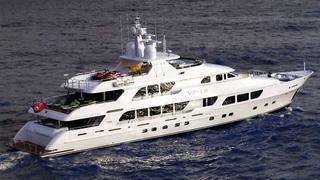 There is a full width VIP together with four guest staterooms below, all fitted with bathrooms ensuite. Now renamed Match Point, she was asking $29.95 million.